Eternal rest grant unto them, O Lord, and fill their souls with splendor. O God, who willed that your Only Begotten Son, having conquered death, should pass over into the realm of heaven, grant, we pray, to your departed servants, those who served our nation in military service, that, with the mortality of this life overcome, they may gaze eternally on you, their Creator and Redeemer. 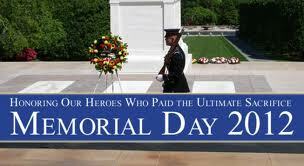 A blessed Memorial Day to all. ''Work is not only an instrument of individual profit, but it is a moment in which to express ones' own skills with a spirit of service in a professional activity, be it factory work, agricultural, scientific or otherwise,"
"Culture, voluntary service and work constitute the indivisible trinomial of the Catholic laity's daily life, which makes belonging to Christ and the Church more real, in the private as much as in the public spheres of society." "The lay faithful put themselves in the game when they touch one or more of these contexts and, in the cultural service, by showing solidarity with those in need and on the job, they strive to promote human dignity." Continue reading Work, culture and education according to Benedict. This page is a archive of entries in the Faith & the Public Order category from May 2012. Faith & the Public Order: April 2012 is the previous archive. Faith & the Public Order: September 2012 is the next archive.